Releasing it as a "limited series" kit is a DUMB idea! To repeat what I wrote five months ago when the first T-34 STZ kit appeared, when the Soviets realized war with Germany was inevitable, and the T-34 began to show a great deal of promise, the Central Committee of the CPSU approved its production at other factories. The primary factory was the Kharkov Steam Locomotive Construction Factory or Factory No. 183 in Kharkov. The first satellite factory was to be the Stalingrad Tractor Factory in Stalingrad, aided by Factory No. 264, the Stalingrad Barge Works, and Factory No. 221, the "Barrikady" artillery foundry. The second was Factory No. 112, "Krasnoye Sormovo," but they also had the advantage of getting 50 knocked-down T-34 tanks to "learn on". It took the STZ much longer to get their production started and the first tanks did not began to roll off the lines until the end of 1940. One of their problems – as with Factory No. 183 – was that the Leningrad factory complexes were stingy with supplying them with the short L-11 gun which mounted in the early T-34; in January 1941 they switched to the superior F-32 design, and cut off the T-34 plants entirely. Factory No. 183 led the changeover to their new gun, the longer F-34, and the STZ followed suit. Originally the STZ tanks were externally no different from the Factory No. 183 tanks, and it was only over time and due to exigencies that the design began to deviate due to local problems and changes to facilitate high rates of production. The base design remained stable through the fall of 1941. By the spring of 1942, the design had changed. The wheels were now cast steel wheels with internal rubber bushings vice the old pressed disks with rubber tires. The turret was a rolled steel design with a removable plate that now covered the entire rear of the turret. The hull design had been changed to accommodate interlocking plates at the front, sides and rear, which is considered the "classic" STZ hull design. By summer 1942 the design had again been changed to now use a "chisel" turret mantelet to speed production (the parts did not require being pressed into shape as with the original design.) Later, the Barge Works created newer designs of both cast and welded turrets with the "chisel" mantelet and "notches" in the lower cheeks of the turret; this is what most modelers consider the "classic" STZ turret. By the time production ceased in early 1943, the factory had built 3,770 tanks, most of which had fought in the legendary battle of Stalingrad. There is a myth that the tanks rolled off the production lines and right into combat outside the factory, but while there is an element of truth to the urgency of production it was not quite so immediate. Five months ago many Soviet T-34 fans were quite disappointed when DML released a Stalingrad T-34 kit – but not the different variant they wanted, but basically the lightly modified variant based on the early knocked-down T-34 kits they received from Factory No. 183 in Kharkov. 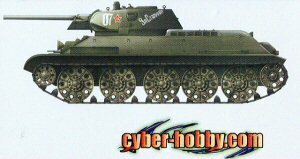 Now cyber-hobby.com has released a complete kit of the later production STZ T-34 with the features modelers were looking for – the "chisel" gun recoil mechanism cover, the "chopped" turret, and the "notched" hull, and this kit is everything they could want in many ways. The kit comes with a totally new upper hull with the correct "notched" hull joints. According to Steve Zaloga, this was caused by two basic reasons: one, to speed up assembly of the hull; and two, since the armor plate was a new high-hardness type of steel, which was not amicable to being welded, it had to have the notching in order to retain ballistic integrity when struck by solid shot projectiles. (The Germans did the same thing for the same reasons – when the Soviets fired blunt nose 122mm projectiles at German Tiger and Panther hulls on test, they discovered they shattered the weld beads whereas pointed rounds would either penetrate or gouge the armor.) This upper hull comes with an integral glacis and fender assembly, so the others in the kit are now spares. Likewise, the kit comes with a new T-34 STZ early-type hull pan with "notched" joints as well as the single road wheel arm stop on the first position. While the kit comes as a "2-in-1" with a choice of early or late STZ turrets, it must be pointed out that this kit comes with a total of THREE turrets – Factory No. 183 welded, STZ early welded, and STZ/Factory No. 264 late welded. The latter is the one most modelers associate with the Stalingrad Tractor Factory, and given all of the options together there are four different main hatches and two new turret roof options in this kit. Also, the STZ late turret has a choice of regular or "chisel" recoil covers for the mantelet. The turret roofs also provide for the modeler's choice of PT-4-7 periscopic sights – zero, one or two. A new clear sprue also provides clear viewing devices for the driver's hatch. There are also a total of four 76.2mm gun barrels included – one two-piece, two "slide molded" and one turned aluminum. The rest of the kit is basically most of what came in the STZ Model 1941 kit except that the pressed steel wheels are no longer included, only the cast steel ones with internal buffering. The usual DML options are provided such as the "Magic Track" two-section single link tracks ("a" with guide tooth and "b" plate without) and a plentiful fret of etched brass. Both 40 liter "box" spare fuel tanks are included and the same odd selection of the 95 liter "cylinder" tanks as was present in the T-34/76 cast turret kit (No. 6418). You also get two styles of engine louvers (vertical and horizontal) and extra fenders as well as spare glacis and driver's hatches. Production credits are to Hirohisa Takada for supervision, Minoru Igarashi and the Dragon engineering team for technical drawings, and Nick Cortese for technical assistance. The kit comes with a total of seven different finishing options: Unidentified Unit, Eastern Front 1942 (4BO green with white crosses); Unidentified Unit, 40th Army, Voronezh 1942 (4BO green with white "swoosh" stripe); 5th Tank Army, Bryansk Front 1942 (4BO green, White 07 "Za Stalina! "); Unidentified Unit, Kaliningrad Front, 1942 (4BO green, white 14 in triangle); Unidentified Unit, Eastern Front 1942 (4BO green with red decorated stars and white "Za Rodinu! "); Unidentified Unit, Eastern Front 1942 (4BO green with brown stripes and white L2-IS); Unidentified Unit, Eastern Front 1942 (4BO green with white 32-37). However, as is unfortunately too often the case, cyber-hobby.com/DML do not tell you which is an "early" tank and which is a "late" tank, which spoils the overall effect. Decals are targeted and from Cartograf. Overall this is the kit many modelers have been waiting for patiently – but the only really dumb thing here is that DML is currently releasing it as a "limited" kit with low circulation, which is unfortunate. This one should have been a full court press and wide release, and as a result there is going to be complaining over access.